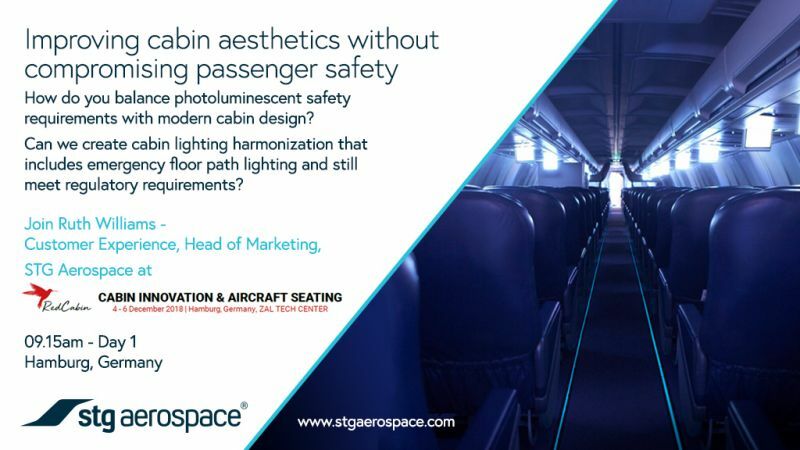 Ruth Williams, Head of Marketing at STG Aerospace, will be making a presentation on the first day of the Cabin Innovation & Aircraft Seating conference, organised by Red Cabin. This event is being held at the ZAL TechCenter in Hamburg, Germany from 4th to 6th December. Under the title ‘Improving cabin aesthetics without compromising passenger safety’, Ruth’s presentation will show how emergency floor path marking can be harmonised with the overall cabin lighting ambience whilst still meeting all regulatory requirements. Established in 1995, STG Aerospace understands the challenges faced by todays leading airlines, MROs and OEMs and continues to push the boundaries in technology and product applications to meet their needs. A world leader in the development of photoluminescence in aviation, the company continues to innovate in other specialist lighting applications including LED mood lighting, providing easy-to-install, reliable products that save weight and reduce operational and maintenance costs.